This wall bowl is from the End Of Day series, meaning it is made with a variety of colors used throughout the day. The colors are very deep and intense and contain nearly every color in the rainbow, with extra added blues. 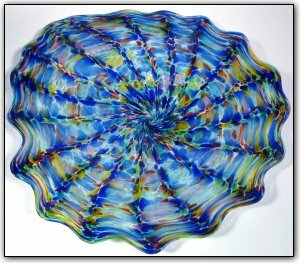 This wallbowl also features textures of scallops, which were created by a technique using an optic mold during the blowing process.